Recently I was asked by JUST EAT if I would like to review their service, let me think about that for a sec........thought about it. YES PLEASE. Finding the Tried and Tasted section really helped me out, we are creatures of habit, we usually order from the same place each week and, luckily for us, our favourite take-away is on the JUST EAT website which gave us a great opportunity to see whether there was a difference in the service or quality to our usual order, Seeing the reviews online also helped, the highest quality restaurants on the website have to have more than 100 online reviews with an average rating of 4.5 or above. There is also something new for 2105, this year, JUST EAT has introduced a new consistency award so look out to see whether your takeaway has this award, it recognises the top 20 from establishments who have achieved Tried & Tasted for four years in a row. I love the idea that restaurants have something to aspire to like this. "Well that's my order done, does anyone else want anything? " The order was taken and instantly I received a confirmation email. BOOM, Sit back, watch The Voice and hide the Monopoly. Half an hour later, FOOOOOOOOOOOOOOOOOD. Yes, there is an egg in my burger, and WHAT? 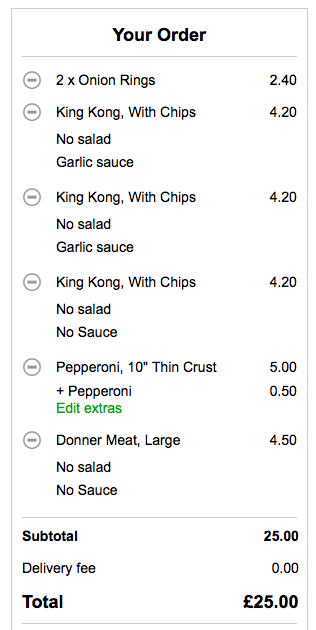 Now before yesterday I had NEVER used the JUST EAT website to order a take away before. I was given the opportunity to do a review and I can genuinely say that from now on, I will be ordering this way. The ease of ordering, the simplicity of the site and the choice of restaurants has really swayed me. I hate talking on the phone anyway, so just being able to power up the Mac and order food for five people with ease makes it the best option for me. so it is easy to find not only your favourite take away but its a great way to discover new ones. Do you use Just Eat? Or would you be interested in trying it after reading this? *Disclaimer, A voucher was sent to me to try out JUST EAT for the first time, my words are all my own. Just Eat fucked up my orders so often over a sustained period of time (incomplete orders sent to takeaways, orders only sent to supplies AFTER the delivery time had passed, double-charging etc) a few years ago - and then only offered me "points" as "compensation", instead of refunds - that I have refused to use them EVER again. I found their customer services to be both rude and useless when things went wrong, to boot. We've been exclusive customers of Hungry House ever since - they have an app, so I don't even have to break out the laptop - and have found their customer service second to none when the takeaways occasionally mess up their end. Sorry, but Just Eat has a MASSIVE thumbs down from me! Given the lack of local choice on Just Eat, I've only used the for one restaurant (which doesn't do direct online ordering); they have been very good, but might be that curry house specifically. we use just mainly because it means you can pay by card. Never had a problem with them. Never used them but upon looking at what places are available near me, i realise you can't order from the single most popular pizza bar in my town so I'll probably give this a miss for pizza but I'd probably use it for indian. I can imagine it being a bit weird although far easier than trying to make sure someone has understood your order on the phone!